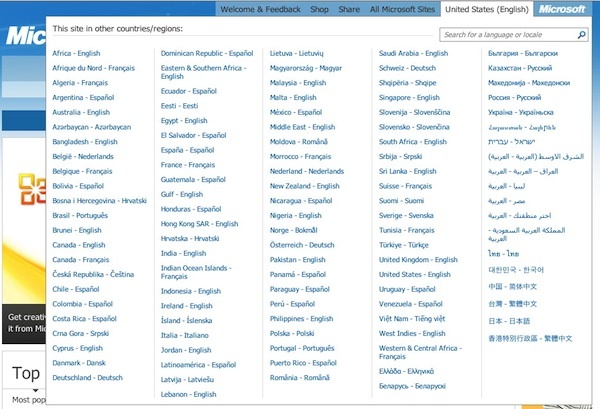 I’m happy to see Microsoft launch a new global gateway on its home page. 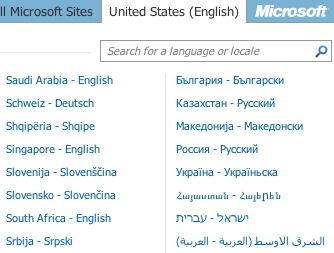 Notice how the country/region options are all nicely presented in the native languages. You might wonder about how the list was sorted, with both Latin and non-Latin scripts involved. I write about this in more detail in my book. But I’ll just say that what you see here is the best (or least worst) option. If you guessed “globe icon” you guessed correctly. A globe icon in the header would help users, regardless of language, more easily find the gateway menu.